Given the Democrats’ poor down-ballot performances in the Obama years, and the Republican dominance of redistricting following the GOP’s success in the 2010 midterm, it’s somewhat fitting that arguably the Democrats’ most marquee victory in 2016 will not help them in the redistricting battles to come after the 2020 census. Despite losing the presidency and failing to capture the Senate, one silver lining for Democrats was taking back the governorship of North Carolina: Now-Gov. Roy Cooper (D) narrowly beat incumbent Pat McCrory (R). The Tar Heel State will have another election, in 2020, before the census is finalized and redistricting will begin across the nation in 2021. Cooper, as the incumbent, may be favored in that election, although incumbency didn’t save McCrory from defeat. But even if Cooper wins, North Carolina is one of the only states that doesn’t give the governor any power over congressional redistricting. So long as Republicans keep control of the state legislature in Raleigh — they currently have big majorities in each chamber — they will draw new congressional district lines after 2020. In many cases, control of the governorship will be a crucial part of the remapping process. Overall, 36 of the 43 states with more than one congressional district give the state legislature responsibility for drawing district lines (Iowa is not included in the 36). In 34 of those 36 states — Connecticut and North Carolina are the exceptions — the governor has veto power over the process, though veto overrides by the legislature are possible. Thus, the state executive is a potentially powerful redistricting ally or obstacle in about 70% of states. Of the 36 states with regular midterm gubernatorial contests in 2018, about three-fourths (26) are states where the legislature draws the map and the governor has some veto power. Presently, Republicans hold 26 of the 36 governorships up in 2018, including 20 of the 26 states where the governor has veto power as a part of redistricting (again excluding Iowa). After the 2020 census, new maps will affect 98% of the 435 House seats, excluding only the seven states with one district (new maps should be in place for the 2022 midterm election). Table 1 lays out the redistricting state of play. If remapping occurred today, the Republicans would have complete control of the redistricting process in 20 states with 200 total congressional districts. In 21 states with 221 districts, power would either be split between the two parties or independent commissions would draw new lines. Meanwhile, the Democrats would hold full power over the process in just two states, Oregon and Rhode Island, with just seven total seats. And the Ocean State appears very likely to lose its second seat in reapportionment, though recent projections suggest that the Beaver State could gain a seat as well. Notes: The categorization of certain states in the table required some judgment calls. If you have any questions about individual states, please email us at goodpolitics@virginia.edu. 1.) State currently has a vacant House seat; delegation totals reflect 2016 election result. 2.) Nebraska technically has a nonpartisan unicameral state legislature, but a majority of its members identify with the GOP. 3.) Connecticut is categorized as “divided” because the state rules require a two-thirds majority vote in the legislature to implement a plan. Democrats lack a two-thirds majority in the legislature. 4.) Iowa is categorized as “commission” because both a nonpartisan advisory body and a bipartisan advisory committee are substantially involved in the map-making process prior to legislative authorization of a plan. 5.) Does not include the seven single-member states (Alaska, Delaware, Montana, North Dakota, South Dakota, Vermont, and Wyoming). Compare these potential 2020 control figures to where the two parties were following the 2000 and 2010 censuses. The 2000 redistricting cycle saw relative balance between the parties: Democrats held total control over redistricting in seven states with 101 congressional districts, Republicans controlled the process in eight states with 98 seats, control was split in 22 states with 190 districts, and commissions of some type determined maps in six states with 39 seats. Based on the presidential vote in districts before and after redistricting, nine more total districts became Democratic-leaning on the new maps, normalized for the statewide vote (i.e., if a district’s two-party vote for Al Gore was 48% and he won 44% statewide, it was a Democratic-leaning district relative to the state as a whole.) 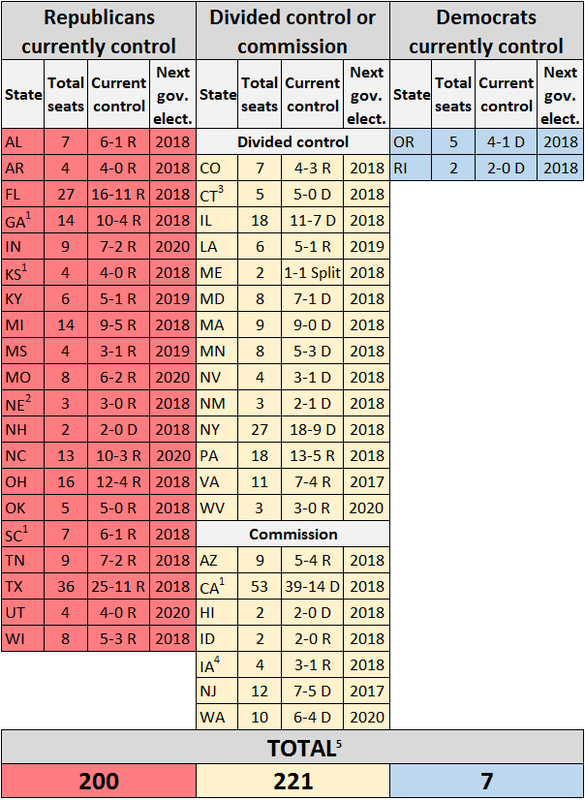 Fast forward to the post-2010 remap, where the incredible gains by the GOP in the 2010 midterm left them in a great position: Republicans fully controlled the process in 18 states with 211 districts, Democrats held sway over just five states with 42 seats, 13 states with 83 districts were split, and commissions determined seven states with 92 seats. The GOP edge in redistricting control resulted in 21 more seats becoming Republican-leaning, based on the 2008 presidential vote and normalized for the statewide vote. It’s impossible to know what the political environment will look like in the fall of 2018, but it’s clear that there will be many gubernatorial contests vital to House redistricting. In highly competitive presidential states such as Florida, Michigan, Pennsylvania, and Wisconsin, the Republicans hold a solid majority of the House seats. In fact, the GOP’s 16-11 advantage in Florida might be larger if not for a court-ordered mid-cycle redistricting prior to the 2016 election (courts found that Republicans had violated a voter-approved constitutional amendment that sought to make the line-drawing process less political). The Republicans also have overwhelming majorities in right of center but still competitive states like Georgia and Ohio. For the Democrats, winning back executive power in states such as these (and holding onto the Pennsylvania governorship) is likely the most immediate route to leverage in the redistricting process. After all, the GOP controls all of the state legislative chambers in the aforementioned states, with large majorities in most cases. Meanwhile, the GOP could benefit from holding onto some blue state governorships, but with caveats. For example, Maryland Gov. Larry Hogan (R) and Massachusetts Gov. Charlie Baker (R) could conceivably hinder Democratic mapping efforts in their very blue states, which have a 7-1 and 9-0 Democratic House delegation, respectively. But it’s possible that the state legislatures in Maryland and Massachusetts could overcome a gubernatorial veto — Democrats currently have sufficient majorities to override in both states. In Illinois, Gov. Bruce Rauner (R) could also veto a plan from the Democratic-led state legislature. However, unlike Hogan and Baker, Rauner’s veto might hold up because Democrats are four seats short of a veto-proof majority in the Illinois House of Representatives. To the west, a Republican takeover of Minnesota’s governorship would give the GOP full control over the process in a state where there could be three endangered Democratic incumbent House members. And in Nevada, retaining the open-seat governorship could serve as a Republican check on the Democratic-controlled state legislature. With control of 33 of the 50 state governorships, the Republican mission is to hold as much ground as possible while possibly winning back the executive mansions in states such as Pennsylvania and Virginia. We are a long way from November 2018, but both sides understand the importance of the election on the next cycle of redistricting. Having been trounced in 2010, the Democrats are focusing more resources on gubernatorial and state legislative contests, an effort that involves former President Barack Obama and former Attorney General Eric Holder. But the Republicans will likely have a war chest advantage, at least when it comes to their national gubernatorial organization: The Republican Governors Association raised $61 million in 2016, compared to just $39 million for the Democratic Governors Association (the RGA usually outraises and outspends the DGA). While both groups will raise and spend far more in the midterm cycle than in a presidential cycle, which has about one-third as many gubernatorial contests, the GOP’s national group could very well have a funding edge in 2018, helped out by having twice as many governors as the Democrats. Democrats have complained about Republican control of redistricting this decade, most notably in 2012, when Democratic House candidates won more votes than Republican candidates but the party captured only 201 House seats. If Democrats want to avoid being at such a disadvantage in the next round of redistricting, 2018 may be their best opportunity to do something about it. 1. Iowa’s state legislature has the final say in redistricting, subject to gubernatorial veto, but we did not include it as a legislative-drawn state because both a nonpartisan advisory body and a bipartisan advisory committee are substantially involved in determining district lines. 2. We compared the presidential vote in a congressional district to the statewide vote rather than comparing it to the national vote in order to better draw out the greater overall change that occurred in the 2010 redistricting cycle than in the 2000 cycle. For example, after the 2010 midterm, North Carolina Republicans’ gerrymander changed the number of Tar Heel State seats that were more Republican-leaning than the nation as a whole from nine to 10 (of 13 total), which appeared to be a small change. But prior to the 2010 GOP wave, Democrats held four of the nine districts in the state that were more Republic-leaning than the nation in 2008. By comparing the district presidential vote to the statewide presidential vote, we see that the GOP-drawn map changed the number of seats that were more Republican-leaning than North Carolina as a whole from seven to 10, which means that nearly a quarter of the states’ seats became notably more Republican. In the 2000 redistricting cycle, Democrats gerrymandered North Carolina. The post-2000 map shifted the number of seats that were more Democratic-leaning than the nation as a whole from two to three, but the state had gained one seat in reapportionment so the number that were more GOP-leaning remained the same (10). But the new lines shifted the number that were more Democratic-leaning than the state from four to seven.